Wigan Athletic Football Club (/ˈwɪɡən/) is a professional football club in Wigan, Greater Manchester, England, which competes in the Championship, the second tier of the English football league system. Founded in 1932, the club have played at the DW Stadium since 1999, before which they played at Springfield Park. Their colours are blue and white stripes, although all-blue shirts have been common throughout the club's history. Wigan were elected to the Football League in 1978, and competed in the Premier League from 2005 to 2013. They won the 2012–13 FA Cup with a 1–0 victory against Manchester City at Wembley Stadium, when Ben Watson scored the winning goal. Wigan have also won League One and are two-times winners of the EFL Trophy. They made their European debut in the 2013–14 UEFA Europa League. Main article: History of Wigan Athletic F.C. Wigan Athletic was formed in 1932, following the winding up of Wigan Borough the year before. Wigan Athletic was the fifth attempt to create a stable football club in the town following the demise of Wigan County, Wigan United, Wigan Town and Wigan Borough. Springfield Park, the former home of Wigan Borough, was purchased by the club for £2,850. Despite their initial application being turned down, Wigan Athletic were elected into the Cheshire County League following the resignation of Manchester Central. The club had also made the first of many attempts to be admitted into the Football League, but failed to receive a single vote. On 27 August 1932, Wigan Athletic played their first ever league game against Port Vale Reserves. The team played in red and white shirts with black shorts. Wigan Athletic won their first honours in the 1933–34 season, finishing as champions of the Cheshire League. In the following season, the club won a second league championship and also entered the FA Cup for the first time, defeating Carlisle United 6–1 in the first round – a cup record for the biggest victory by a non-league club over a league club. In the 1935–36 season, the club won their third consecutive Cheshire League title and the Lancashire Junior Cup. After the Second World War, Wigan Athletic adopted their more familiar blue and white strip. The club struggled to assemble a competitive side, and finished bottom of the league in 1946–47 season. Despite their pre-war success, the club failed to gain re-election and were replaced by Winsford United. The club joined the Lancashire Combination, winning the league in their first season. In 1950, Wigan Athletic came close to election to The Football League, narrowly losing out to Scunthorpe United and Shrewsbury Town. In the 1953–54 season, Wigan played an FA Cup match against Hereford United in front of a crowd of 27,526 – a club record and also a record attendance for a match between two non-league teams at a non-league ground. In the next round of the cup, Wigan Athletic were drawn against First Division side Newcastle United. Wigan Athletic held their top flight opponents to a 2–2 draw at St James' Park, but went on to lose the replay 3–2. In 1961, the club moved back to the Cheshire League. In the 1964–65 season, Wigan Athletic won their first Cheshire League title since returning to the league, with top goalscorer Harry Lyon scoring 66 times. He remains the club's greatest goalscorer of all time. Wigan Athletic won four cup titles in the 1966–67 season (Lancashire Floodlit Cup winners, Liverpool Non League Senior Cup winners, Northern Floodlit League winners, Northern Floodlit League Cup winners) and were also Cheshire County League runners-up. In 1968, Wigan Athletic were founder members of the Northern Premier League. Winning the league title in 1970–71, leading goalscorer with 42 goals, including seven hat-tricks, was Geoff Davies who scored 28 goals in the following 1971–72 season. After 34 failed election attempts, including one controversial but headline-making application in 1972 to join the Scottish League Second Division, Wigan Athletic were elected to the Football League in 1978. As a non-league club, the team played at Wembley Stadium for the first time in the 1973 FA Trophy Final, where it lost 2–1 to Scarborough. Wigan Athletic finished in second place in the Northern Premier League in the 1977–78 season, behind winners Boston United. But as Boston's ground and facilities did not meet the Football League criteria for a League club, whereas Springfield Park did, Wigan Athletic were put forward for election to the league. There was no automatic promotion to the Football League until 1987, and at that time a club had to be 'voted out' of the League to allow a non-league team to be promoted in their place. At the end of the 1977–78 season, Southport finished next to bottom of the old Fourth Division, and faced near neighbours Wigan Athletic for their place in the league. The first round of voting was tied, with both clubs receiving 26 votes. After a tense re-vote which Wigan won 29–20, Southport lost their place in the Fourth Division and Wigan Athletic became an English League club on 2 June 1978. In the club's first season of league football, Wigan Athletic finished in sixth place, just six points off promotion and playing in front of an average crowd of 6,701. Two more top-half finishes came in the following seasons, though a relatively weak 1980–81 season saw the dismissal of long-serving manager Ian McNeill shortly before the end of the season. They gained their first Football League promotion under the management of former Liverpool player Larry Lloyd in 1981–82, when a points tally of 91 saw them join the former Division Three for the first time, beginning a 10-year spell in English football's third tier. The club struggled in their first season in Division Three, which led to Lloyd's sacking in early 1983, at which point Bobby Charlton, a director at the time, took over as temporary manager before being replaced by Harry McNally. Under McNally's management, the club stabilised in Division Three and secured a pair of mid-table finishes, but a dreadful 1984–85 season cost him his job, with Tranmere manager Bryan Hamilton stepping into the breach. Under Hamilton's management, the club's performances went to the next level and they won their first silverware as a league club that season with the Freight Rover Trophy. They were beaten in the Northern final of the same competition the following season by Bolton Wanderers. More importantly, Hamilton achieved Division Three survival, which had looked an impossible task earlier that season. The 1985–86 season saw a marked improvement in the club's league form, eventually finishing in fourth position, a then-club record high which would stand for 17 years until 2002–03. Wigan Athletic finished the season just one point outside the promotion places in the final season before the Football League introduced the play-off system for promotion and relegation. However, Hamilton's feats attracted the attention of First Division Leicester City and he left to become their manager in the summer 1986. His assistant, Ray Mathias, who had followed him from Tranmere, stepped up to the Wigan Athletic manager's job. Wigan Athletic managed an identical fourth-place finish in the 1986–87 season, but this time were rewarded with the chance to compete for the final promotion place in the new play-off system. (In the first two years of the play-off system, teams finishing third, fourth and fifth joined the team finishing 20th in the division above to play-off for the promotion place; this was changed to the teams finishing third, fourth, fifth and sixth from the 1988–89 season). The Latics lost at the two-legged semi-final stage to Swindon, who went on to win the final promotion place. The fourth-place finishes of the 1985–86 and 1986–87 seasons proved to be the high points of Wigan Athletic's first stint in Division 3. For the next five years, they finished mid-table, flirting with relegation in 1988–89 (at which time Mathias was sacked and previous manager Bryan Hamilton returned) and 1989–90, until they were relegated for the first time in the club's league history in 1992–93. Wigan Athletic finished in 23rd place, amid tumbling attendances which had fallen from averages of 3,000–4,000 in Wigan Athletic's Division 3 years to just 2,593 in 1992–93. Hamilton resigned shortly before the club were relegated, and was replaced by Kenny Swain. A year later, with the club back in the fourth tier of the English League, the Latics finished fourth from bottom, in 19th place. While there was no relegation that season due to the lack of a promotable club in the Football Conference, this remains the club's lowest-ever finish. The following season would prove to be arguably even worse, as Swain was sacked early in the campaign following a horrific start, and former player Graham Barrow took over as manager. Despite the club being rooted to the bottom of the table until the start of December, the second half of the campaign saw a major upturn in form, and they finished well clear of the relegation zone in 15th place. Attendances fell to a lowest-ever Wigan Athletic League average of 1,845 by 1995. Local entrepreneur Dave Whelan acquired the club in 1995, providing funds to move into the JJB Stadium, now named the DW Stadium after Whelan's sports shops, DW Sports. In February 1995, local millionaire and owner of JJB Sports, Dave Whelan purchased the club. Through Whelan's business connections in Spain he attracted three Spaniards to the club – Roberto Martínez, Isidro Diaz, and Jesus Seba – who became known as the Three Amigos. The trio became the on-pitch symbols of Whelan's ambitious plan to take Wigan Athletic into the Premier League. The Three Amigos were joined at the club by John Deehan, who replaced Barrow as manager during the 1995–96 season following a 6–2 home defeat to Mansfield Town. Deehan took the Latics within two points of a play-off place in his first season; the club had in fact been in the final automatic promotion spot with four games remaining, but lost them all and so failed to even make the play-offs. The following year Wigan Athletic became Division Three champions on the last day of the season, Graeme Jones scoring a club record 31 league goals in the process. In most seasons they would have been runners-up, but a temporary rule change which saw goals scored take precedence over goal difference allowed them to finish above runners-up Fulham, who had the same number of points and a better goal difference. Following a mid-table finish in Division Two the following season, Deehan quit to become Steve Bruce's assistant at Sheffield United. He was succeeded by Ray Mathias, who returned for his third stint as Wigan Athletic manager. Mathias' team won the Football League Trophy in 1999, beating Millwall 1–0 at Wembley Stadium. The same season the Latics reached the Division Two play-offs, losing 2–1 on aggregate to Manchester City. Mathias was sacked, and replaced by John Benson. He led the team to the top of Division Two in his first six months, but they were only able to qualify for the play-offs. In what was the last ever Division Two play-off final to be played at the old Wembley Stadium, Wigan lost 3–2 after extra time to Gillingham. Benson moved 'upstairs' to the new post of director of football in the summer of 2000, when former Arsenal manager Bruce Rioch took the manager's job for the 2000–01 season. Rioch was hampered by severe injury problems and after a difficult and often unimpressive first half of the season left the club in February 2001. He was temporarily replaced by club stalwart Colin Greenall, before the surprise appointment of Steve Bruce for the final eight games of the season. His arrival brought renewed vigour to Wigan Athletic performances, but the club ultimately lost in the play-offs again, this time against Reading, and Bruce left for Crystal Palace. To signify the involvement of the local authority, Wigan Metropolitan Borough Council, Wigan Athletic have used their coat of arms as their club crest, from 1989 to 2008. In the summer of 2001, the former Latics forward Paul Jewell took over as manager following an unsuccessful spell at Sheffield Wednesday. His first season in charge saw mixed results and an embarrassing defeat to non-league Canvey Island in the FA Cup first round, although the club eventually finished in mid-table. Jewell's second season in charge was far more successful. Wigan Athletic went on a run to the quarter finals of the League Cup, beating Premier League opponents West Brom, Manchester City and Fulham en route. 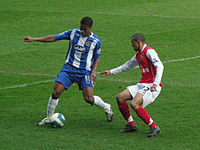 Wigan Athletic won the Division Two championship in 2002–03 with a points total of 100, powered by the goals of then-record £1.2 million signing Nathan Ellington, with a run of 10 consecutive wins along the way. The club lost only four times all season, and Wigan Athletic secured promotion to the second tier of the English Football League for the first time in their history. After losing their first ever game in Division One, Wigan Athletic confounded expectations to go unbeaten for the next 17 games and sit atop the division by November 2003. A weak finish saw Wigan Athletic win only three of their last 10 games to finish seventh in Division One – a last-minute goal by West Ham's Brian Deane in the final game of the season saw the Latics drop out of the play-off places in favour of eventual play-off winners Crystal Palace. Hoping to build on the previous season's disappointing finish, the Latics went one better than 2003–04 by remaining unbeaten for the first 17 games of the 2004–05 season. Along with Sunderland and Ipswich, the Latics remained in the promotion hunt all season. By the last day of the season, Sunderland had already won the title and Wigan needed at least a draw against Reading – who themselves needed to win to finish in sixth place – to beat Ipswich to the last automatic promotion spot. A 3–1 victory in front of their home fans at the JJB Stadium earned Wigan Athletic promotion to the top division of English football for the first time in their 73-year history. The club's first ever Premier League game was a sell-out at the JJB Stadium against holders Chelsea, a 1–0 defeat after an injury-time winner by Hernán Crespo. A successful run followed, and by November, Wigan were second in the league. Good league form was coupled with an equally strong performance in the Football League Cup, with Wigan reaching their first ever major cup final after defeating Arsenal on away goals in the semi-final. In the final, Wigan were defeated 4–0 by neighbours Manchester United. Wigan Athletic eventually finished the season in 10th place, which remains the club's highest ever league placing. Defender Pascal Chimbonda was also included in the 2005–06 PFA Team of the Season, capping off his season by being picked for the France squad for the 2006 FIFA World Cup. During the close season, Wigan sold many players who had starred in their first season in the Premier League, such as Jimmy Bullard, Jason Roberts and Stéphane Henchoz, while bringing in replacements including Emile Heskey, Denny Landzaat, Chris Kirkland and Antonio Valencia. After a mid-table start to the 2006–07 season, Wigan had eight consecutive losses from mid-December, but were 15th in early March. On the final day of the season, Wigan got a 2–1 away win against Sheffield United, which kept them up at the expense of their opponents. The following day, Paul Jewell unexpectedly resigned as manager; his assistant Chris Hutchings was appointed as his replacement. Wigan's third Premier League campaign saw changes in the squad, with Titus Bramble, Mario Melchiot, Jason Koumas and Marcus Bent among the players brought in, and Melchiot was installed as the new club captain. The 2007–08 season began well for Wigan, with Emile Heskey recalled to the England squad, as the first Wigan player to represent England whilst a full member of the club. However, he broke his foot immediately after his England call-up, and was out injured for six weeks. The club's league position subsequently worsened, and on the back of a run of six consecutive defeats Wigan fell into the relegation zone. Whelan took the decision to sack Hutchings on 5 November 2007, after 12 games in charge, reinstating Bruce, who saved the club from relegation. In the summer of 2008, Bruce signed Lee Cattermole from Middlesbrough for £3.5 million, and Egyptian striker Amr Zaki sign on an initial one-year loan. Zaki had scored 10 Premier League goals by February 2009, as Wigan reached seventh place in the table with 34 points from 25 games. January saw the departure of two key first team members, Wilson Palacios and Emile Heskey, to Tottenham and Aston Villa respectively. Despite these changes, Wigan finished the season in 11th place with 45 points, their second-best finish ever in the Premier League. On 3 June, Bruce left Wigan for the second time to take over the vacant manager position at Sunderland. July saw the departure of another key first team member Antonio Valencia to Manchester United. Before the 2009–10 season got underway, Cattermole left for Sunderland. Former Wigan player Roberto Martínez managed the club to victory in the 2013 FA Cup Final, their first major honour. Wigan appointed Roberto Martínez, then manager of Swansea City, as manager prior to the 2009–10 Premier League season. He previously played for Wigan from 1995 to 2001. On 26 September, they claimed their first three points against a "Big 4" team after beating Chelsea 3–1, with goals from Titus Bramble, Hugo Rodallega and Paul Scharner. A late surge that included a 1–0 win over Liverpool and a 3–2 win over Arsenal – the latter of which saw Wigan recover from two goals down with ten minutes remaining to win in injury time – saw the team once more survive relegation. Most notably, having never defeated any of the traditional "Big Four" in the league until their win over Chelsea (and with only one win over any of them in cup competitions), Wigan ended the season having defeated three of them at home. Despite this high, the season also saw two humiliating 8 goal defeats, firstly a 9-1 thrashing at Tottenham in November, and finally an 8-0 defeat to Chelsea on the final day of the season, a match which saw their opponents crowned Premier League champions. In the 2010–11 season, Wigan fell to the bottom of the league by the end of February, following a 4–0 defeat to Manchester United. However, despite remaining in the bottom three for the majority of the season, they managed to retain their Premier League status on the last day of the season, defeating Stoke City at the Britannia Stadium after a goal from Hugo Rodallega. On 7 May 2012, they simultaneously secured their Premier League status and relegated Blackburn Rovers with a 1–0 victory at Ewood Park. In 2013, after beating Everton in the quarter-final and Millwall in the semi-final, Wigan reached the FA Cup Final for the first time in their history. In the final, played at Wembley Stadium, Wigan beat Manchester City 1–0, with a goal by Ben Watson scored in injury time. Wigan's first ever major trophy also gave the club a place in the group stage of the Europa League. Following their 4–1 defeat to Arsenal three days later, Wigan Athletic ended their eight-year spell in the Premier League and became the first team to be relegated and win the FA Cup in the same season. 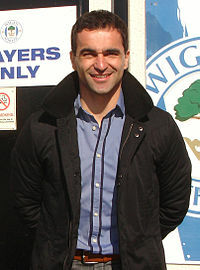 On 5 June it was announced that Martínez had left Wigan and had signed for Everton on a four-year deal. Owen Coyle became the new manager of Wigan Athletic when Martínez left for Everton. The team lost to Manchester United in the Community Shield. Coyle left by mutual agreement on 2 December 2013 after a poor start to the season, and was replaced by Uwe Rösler. On 12 December in his first match, Wigan were eliminated from the Europa League group stage after defeat to Maribor. On 9 March 2014 Wigan beat Manchester City in the 6th Round of the FA Cup to reach the semi-final at Wembley for the second successive year, where they played Arsenal, and lost 2–4 on penalties after normal time and extra time resulted in a 1–1 draw. After finishing 5th in the Championship, Wigan lost their play-off semi-final to Queens Park Rangers. Rösler was sacked in November 2014 with the club in the relegation places, and was replaced by Malky Mackay. Whelan resigned as chairman on 3 March 2015, remaining as owner but handing over the chairmanship to his grandson David Sharpe. The following month, with Wigan in danger of relegation to League One, Mackay was sacked and replaced by former Wigan captain Gary Caldwell, yet the team ended the season with relegation. The squad changed drastically, including the signings of Will Grigg from Brentford and Reece James from Manchester United. The side lost only once in 23 matches in the second half of the season and won the division, with Grigg the league's top scorer with 25 goals. In October 2016, following a poor start to the season, Caldwell was sacked as manager and replaced by Manchester United coach Warren Joyce. Results did not improve under Joyce, who was sacked in March 2017. Wigan were subsequently relegated back to League One in April and interim manager Graham Barrow left, ending a 15-year association with the club. Paul Cook, who had just won League Two with Portsmouth, was appointed Wigan manager in June 2017. Wigan competed in the 2017–18 season of League One in which they finished first resulting in promotion back to the Championship. Their promotion was sealed by a 4–0 win against Fleetwood Town. In the 2017–18 season of the FA Cup, Wigan reached the quarterfinals, where they were knocked out by Southampton F.C. in a 2–0 loss. Notably, Wigan had beaten Manchester City in the Fifth Round Proper at home, winning 1–0 due to Will Grigg scoring at the 79th minute. At the end of the season it was announced that the Whelan family had agreed a deal to sell the club, stadium and training facilities to the Hong Kong based International Entertainment Corporation (IEC) in a £22m deal. On 2 November 2018 IEC received shareholder approval to complete the acquisition of the football club, bringing to an end the 23 years of Whelan family ownership. In a letter to the fans chairman David Sharpe confirmed that he along with Matthew Sharpe and non-executive director Garry Cook would resign from the board upon completion of the ownership transition. Warm-up at the DW Stadium. Wigan Athletic's stadium is the 25,138 capacity DW Stadium, part of the Robin Park complex in Wigan. It has been the club's home since the 1999–2000 season. Wigan Athletic owns the stadium, but leases the ground to rugby league team Wigan Warriors, The stadium cost £30 million to construct. Previously, home games were played at Springfield Park, the former home of Wigan Borough, which was demolished in June 1999; it is now the site of a housing development. 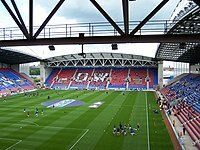 The record attendance at the DW Stadium (then known as the JJB Stadium) for Wigan Athletic is 25,133 for a game against Manchester United on 11 May 2008 – the final match of the 2007–08 season. The JJB Stadium was the fourth attempt at re-development/re-location for Wigan Athletic, the first coming in 1986 when then-chairman Bill Kenyon revealed plans for a 15,000 all-seater development at Springfield Park including a hotel and shopping facilities. The club were to play at the nearby Woodhouse Stadium (formerly Wigan Municipal Stadium – now demolished) while the building work took place. In 1990, Kenyon submitted his second scheme which would cost £3m, hold 12–15,000 fans and involve moving the pitch nearer to the car park. Neither efforts got past the planning stage. The next chairman, Stephen Gage, spent most of 1993 and 1994 trying to relocate the Latics to the then Robin Park Stadium (now demolished) until his plans were scuppered by Wigan Council when the local council announced plans for their own ground involving Wigan Warriors. Mr Gage finally admitted defeat when he sold the Latics to Dave Whelan on 27 February 1995 for around £1m. Plans for the JJB Stadium were first published in 1997. Contracts for the new stadium were signed in late 1997 and work began immediately. Originally the ground was to be built for both Wigan Athletic and Orrell R.U.F.C., as grants were only available for multi-use stadia at that time. Wigan Warriors did not figure in the equation until Dave Whelan bought the rugby league club some 12 months later after protracted negotiations with the directors of the rugby league club. The modern all-seater stadium was officially opened on 4 August 1999. Its inauguration was marked with a friendly between Wigan and neighbours Manchester United, who were then reigning European Champions, with Alex Ferguson officially opening the stadium. However, Wigan Athletic hosted Morecambe three days earlier on 1 August as a dress rehearsal for the official opening against Manchester United. The game was played during a violent electrical storm and torrential rain, even so, 4,020 supporters attended and the game ended in a goalless draw. The first competitive football match took place on 7 August 1999, with Wigan Athletic facing Scunthorpe United in a Division 2 match. Simon Haworth scored twice, including the first competitive goal at the new stadium, as Athletic won 3–0. 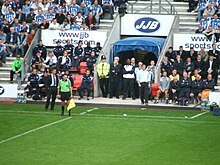 On 7 March 2005 Greater Manchester Police announced that it would stop policing Wigan Athletic matches at the stadium from 2 April. This move left Wigan Athletic facing the prospect of playing their home games in the Premier League in an empty stadium, so they paid the money they owed to the police. The club appealed against the payments in court and won, with the claims expected to earn the club around £37,000. On 25 March 2009 it was announced that Wigan Athletic would change the name of their stadium to The DW Stadium, after chairman Dave Whelan's commercial venture, DW Sports Fitness. For 2013–14 Europa League fixtures held at the stadium, the ground was known as The Wigan Athletic Stadium. Wigan Athletic Official Supporters Club (formally known as Wigan Athletic Supporters Travel Club) is the official supporters' association of Wigan Athletic Football Club. The supporters club are a non-profit organisation run by volunteers and meet before home matches in the South Stand Bar. The Latics' most vocal supporters can be found in the East Stand of the DW Stadium which houses up to 8,206 fans The South Stand of the ground is the family stand. A long-standing song sung by fans of the club is You Are My Sunshine. In more recent times, I'm a Believer, Hokey cokey, We Built This City and Gold are among some the songs that have been adapted by Wigan supporters. Although as many as three unofficial fanzines have existed at the same time in recent years, there is currently just one. The Mudhutter Football Express is released between 5 and 6 times during the season and costs £2 for the printed version or £1.49 for the digital edition. Resulting from a number of incidents at Latics matches where smoke bombs were used by fans (resulting in 17 banning orders as a result of one fixture), several club statements were issued and police presence was increased at some matches. Data from the UK Football Policing Unit found that Wigan Athletic along with Everton and Manchester United had the highest number of incidents involving pyrotechnics. Wigan's return to the Championship saw an average away following of over 1,200. This figure did not include Europa League, Community Shield, League Cup and FA Cup fixtures, where on average supporters turned up in greater numbers. In 2013, the club sold out their 32,000 allocation for the FA Cup Final and sold 20,000 tickets for the FA Cup semi-final. A total of 5,500 was also sold for the FA Community Shield in the same year. In 2014, hundreds of fans took part in a charity walk from Wigan to Bolton in aid of local charity Joseph's Goal. Joseph was Wigan's mascot in the 2013 FA Cup Final, led out by captain Emmerson Boyce. On Boxing Day, over the years many fans have chosen to attend Wigan Athletic's match in fancy dress. This is particularly prominent with away fixtures on that day where the fans are known as the 'Banana Army'. However, on Boxing Day in 2014 a boycott of the club's fixture against Leeds United was ordered by some supporters due to the ticket prices for the match at Elland Road. Around 750 away fans attended the match. During the 2014–15 season, a Fan Advisory Board (FAB) was set up by the club to allow supporters of Wigan Athletic to have a greater say on any issues they may have. The board meets every month to six weeks with the first meeting having taken place in November 2014. One of Wigan Athletic's longest and recently forgotten rivalries was with nearby Lancashire based club Chorley, although the two clubs have not played a league game since 1971 when they were in the Northern Premier League. Since Wigan Athletic's admission to the Football League in 1978, the club has built up several rivalries, mainly with Bolton Wanderers, the club's primary derby match since reaching the Premier League in 2005. They have other local rivalries with Manchester City, Preston North End, Oldham Athletic, Blackburn Rovers, Burnley, Bury and Rochdale. There is also a long-standing issue with Wigan Rugby League which predates the club. This was first reported during the final season of Wigan Town in 1908 when the rugby club purposly arranged games to coincide with those of the football club in an attempt to force Town out of existence. This worsened when Latics entered the Football League in 1978 and was exacerbated in the mid-1980s when one of the then directors of the rugby club, Maurice Lindsay, made derogatory comments about the football club during a television interview. Lindsay was later appointed to the board of directors at Wigan Athletic, much to the disapproval of many older supporters. Wigan's victory in the 2013 FA Cup Final qualified them for European football for the first time, earning them an automatic place in the group stage of the 2013–14 UEFA Europa League. As listed on the official Wigan Athletic website. Antonio Valencia's £16 million sale to Manchester United in 2009 is the largest transfer involving Wigan Athletic. ^ "INTERNATIONAL ENTERTAINMENT CORPORATION COMPLETE TAKEOVER OF WIGAN ATHLETIC FOOTBALL CLUB". Wigan Athletic Official Site. Retrieved 7 November 2018. ^ "1932–78 – The Formation of Wigan Athletic". Wigan Athletic F.C. Archived from the original on 13 April 2012. Retrieved 23 September 2011. ^ a b "Wigan Athletic". Historical Football Kits. Retrieved 23 September 2011. ^ a b c Rundle, Richard. "Wigan Athletic". Football Club History Database. Retrieved 23 September 2011. ^ "The Pie at Night – By Wigan Athletic fans for anyone who'll listen". Archived from the original on 6 February 2015. ^ a b "England historical attendance and performance". Retrieved 16 June 2016. ^ "Wigan 0–1 Chelsea". BBC Sport. 14 August 2005. ^ "Man Utd ease to Carling Cup glory". BBC Sport. 26 February 2006. Retrieved 23 June 2008. ^ "Gerrard named player of the year". BBC Sport. 23 April 2006. ^ "Bruce named as Sunderland manager". BBC Sport. 3 June 2009. ^ "United sign Valencia". ManUtd.com. Manchester United. 30 June 2009. Archived from the original on 7 July 2009. Retrieved 30 June 2009. ^ "Wigan finally land boss Martinez". BBC Sport. 15 June 2009. ^ "Tottenham 9-1 Wigan". BBC. 22 November 2009. Retrieved 14 March 2019. ^ "Chelsea 8-0 Wigan". BBC. 9 May 2010. Retrieved 14 March 2019. ^ "Rodallega saves Wigan". ESPN Soccernet. 22 May 2011. Retrieved 24 May 2011. ^ "FA Cup final: Manchester City v Wigan – LIVE!". The Independent. 11 May 2013. Retrieved 12 May 2013. ^ "Giant killers Wigan win FA Cup with dramatic last minute goal against Manchester City". Daily Mail. 11 May 2013. Retrieved 12 May 2013. ^ "Roberto Martinez: Everton appoint former Wigan manager". BBC Sport. 5 June 2013. Retrieved 1 September 2013. ^ "Owen Coyle: Wigan Athletic name former Bolton boss as manager". BBC Sport. 14 June 2013. ^ "Owen Coyle: Wigan manager leaves by mutual agreement". BBC Sport. 2 December 2013. Retrieved 2 December 2013. ^ "NK Maribor v Wigan". BBC Sport. 12 December 2013. ^ "QPR 2–1 Wigan". BBC Sport. 12 May 2014. Retrieved 30 May 2014. ^ "Uwe Rosler: Wigan sack manager after poor start to season". BBC Sport. 13 November 2014. Retrieved 14 November 2014. ^ "Dave Whelan: Wigan Athletic chairman resigns after 20 years". BBC Sport. 3 March 2015. Retrieved 30 April 2015. ^ "Wigan Athletic: Gary Caldwell named manager". BBC Sport. 7 April 2015. Retrieved 30 April 2015. ^ "Rotherham 2–1 Reading". BBC Sport. 28 April 2015. Retrieved 30 April 2015. ^ "Will Grigg: Wigan Athletic sign Brentford striker". BBC. Retrieved 19 November 2015. ^ "Reece James joins Wigan Athletic from Manchester United". Wigan Athletic. Retrieved 19 November 2015. ^ "Wigan Athletic results 2015/16". World Football. Retrieved 27 April 2016. ^ "League One Top Scorers 2015–16". BBC Sport. 8 May 2016. Retrieved 10 May 2016. ^ "Gary Caldwell: Wigan Athletic manager sacked after 18 months in charge". 25 October 2016 – via www.bbc.co.uk. ^ "Warren Joyce: Wigan Athletic appoint Man Utd U21 boss as manager". BBC Sport. 2 November 2016. Retrieved 22 February 2017. ^ "Warren Joyce: Wigan Athletic part company after four months". BBC Sport. 13 March 2017. Retrieved 15 March 2017. ^ "Barrow leaves Latics". Wigan Today. Wigan Today. Retrieved 30 May 2017. ^ "Paul Cook: Wigan Athletic appoint Portsmouth boss as new manager". BBC Sport. 31 May 2017. Retrieved 27 December 2017. ^ Brewin, John (21 April 2018). "Wigan and Luton promoted as Macclesfield return to Football League". The Guardian. Retrieved 7 August 2018. ^ Sanders, Emma (18 March 2018). "Wigan Athletic 0–2 Southampton". BBC Sport. Retrieved 7 August 2018. ^ Reddy, Luke (19 February 2018). "Wigan Athletic 1–0 Manchester City". BBC Sport. Retrieved 7 August 2018. ^ "Wigan Athletic: Chinese company IEC plans to spend once £22m deal completed". BBC Sport. 21 May 2018. Retrieved 1 June 2018. ^ "POLL RESULTS OF THE EXTRAORDINARY GENERAL MEETING" (PDF). International Entertainment Corporation. 2 November 2018. Retrieved 6 November 2018. ^ "A LETTER TO THE WIGAN ATHLETIC SUPPORTERS FROM CHAIRMAN DAVID SHARPE". Retrieved 6 November 2018. ^ Andrews, Phil (29 November 1999). "Football: Wigan building brighter future on solid ground". The Independent. London. Retrieved 28 December 2008. ^ "Police match cost appeal success". BBC News. 19 December 2008. ^ "THE DW STADIUM". Archived from the original on 21 June 2016. Retrieved 16 June 2016. ^ "Roberto Martinez leads Wigan FA Cup celebrations". Retrieved 16 June 2016. ^ Premiership Signatures (13 May 2013). "Wigan Athletic fans singing 'I'm a believer' at the DW Stad". Retrieved 16 June 2016 – via YouTube. ^ gmarrs (16 February 2014). "We beat Man City, We beat Man City with a Watson goal!". Retrieved 16 June 2016 – via YouTube. ^ "I'm a believer! Wigan Athletic fans optimistic ahead of historic FA Cup final against Manchester City – Mancunian Matters". Retrieved 16 June 2016. ^ "The Mudhutter Wigan Athletic Fanzine – The Mudhutter". Retrieved 16 June 2016. ^ Athletic, Wigan. "CLUB STATEMENT". Retrieved 16 June 2016. ^ "Premier League: Banning orders or prison warning for fans with flares". Retrieved 16 June 2016. ^ "Away fans will give Wigan a lift in Europe, says Coyle... but he admit". Retrieved 16 June 2016. ^ Britton, Paul (26 September 2013). "Own goal: Etihad Stadium ticket chaos means fans missed half the game". Retrieved 16 June 2016. ^ "Cup holders' City allocation selling fast". Retrieved 16 June 2016. ^ "Footy fans walk for Joseph's Goal". Retrieved 16 June 2016. ^ WiganAthletic_user. "BANANA DRAMA OVER". Retrieved 16 June 2016. ^ "The Pie at Night – By Wigan Athletic fans for anyone who'll listen". Archived from the original on 13 December 2014. ^ SLO, Wigan Athletic. "Are you interested in joining the Wigan Athletic Supporter Liaison Officers Latics Fan Advisory Board?". Retrieved 16 June 2016. ^ "Maurice Lindsay v wigan athletic". YouTube. ^ "Maurice Lindsay Joins Latics board". Paralatic. Retrieved 2 June 2017. ^ Taylor, Jason. "Maurice Lindsey takes the hint and leaves Wigan Athletic – Cockney Latic". www.cockneylatic.co.uk. Retrieved 2 June 2017. ^ "Wigan Athletic First Team Player Profiles". Wigan Athletic F.C. Retrieved 27 November 2018. ^ "Senior Management". Wigan Athletic F.C. Archived from the original on 11 November 2018. Retrieved 11 November 2018. ^ "Player of the Year". Retrieved 13 August 2013. ^ "A role call of Wigan Athletic managers". Wigan Athletic FC. Retrieved 19 May 2013. ^ "RECORDS & HONOURS". Retrieved 16 June 2016. Wikimedia Commons has media related to Wigan Athletic F.C..
"Brief history of Wigan Athletic". Archived from the original on 14 December 2005. Retrieved 5 December 2005. This page was last edited on 27 March 2019, at 07:04 (UTC).